Hisense budget OLED TV set for Q4 launch | What Hi-Fi? OLED could be about to get more affordable. If you're after an OLED TV but didn't think your budget could stretch to it, help could be on hand in the form of the first Hisense OLED TV. The Chinese giant, which holds the number one TV spot in its native country, and knows a thing or two about affordable TVs, was sheepishly showing its first ever OLED at IFA in Berlin ahead of a launch later this year. 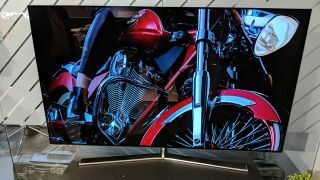 The 4K OLED was first teased at CES 2018 at the start of the year and has now been confirmed to go on sale in Australia - we're not sure why, either - later this year. UK customers shouldn't have too long to wait, the Hisense OLED TV is set for a UK launch in Q1, if not before. We're told Hisense will be aiming to compete with other entry-level OLED offerings when it comes to price, notably the £1300 55in Toshiba OLED. Using an LG OLED panel, expect 4K, HDR and all the typical smart offerings to be on board. We look forward to seeing how the picture performance compares.